Absent the obvious Game of Thrones reference I will say, “Winter is coming.” And with this cold season comes the need to bundle up in style for your winter time wedding. That’s why I thought it would be fun to take a look at some faux fur wraps for you and your bridesmaids to keep toasty warm on the big day! As the term suggests, faux fur (a.k.a. fake fur) is a kind of fabric that imitates real animal fur. Today, it is a popular fashion accessory that is used during many occasions. For example, brides hosting a winter wedding may like to buy faux fur wraps to give as a gift to their bridesmaids. Faux fur was first introduced in 1929. Since then, people have fallen in love with this fabric, which looks almost like the real thing. As this article from The Guardian reports, faux fur creates a “royal look” that many people simply adore. Faux Fur by Royal Scout and Co.
Faux fur is made from a variety of materials. Most of its fibers are made of acrylic polymer, which is created through chemical processes involving coal, limestone, and petroleum. Faux fur also includes secondary monomers, which enable the fiber to absorb different colored dyes. Aside from this ability to absorb colors well, the fibers used in faux fur are also more resistant to fire. Furthermore, the fibers in faux fur are light and springy, making the accessory easy to carry around. The materials are also resistant to natural elements such as heat and sunlight. When you wash them, they do not wear or tear easily. Aside from polymers and monomers, other fabrics are added to improve the appearance and texture of the faux fur. These fabrics include mohair, silk, and wool. Meanwhile, cotton is used in making the backing material of the faux fur. To make the faux fur even more smooth and shiny, silicone, resins, and other materials are added. After this, the faux fur is colored with dyes and various colorants. Most manufacturers often use colors and patterns that resemble real fur, but some like to create new and unusual designs. These days, people tend to buy faux fur instead of the real thing because they value animal rights. In fact, even the People for the Ethical Treatment of Animals (PETA) organization agrees that faux fur is a good alternative to real fur. This way, no animals have to be hunted and killed for their fur. Personally, I am an animal lover and feel strongly about never buying any product (like real fur) that harms an animal. Despite the rise of the faux fur industry, there are still cases of real fur getting into the market. 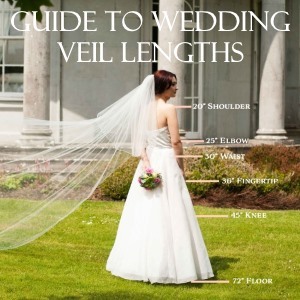 And so, if you are planning to buy some faux fur wraps for bridesmaids, you should know how to distinguish faux fur from the real thing. Real fur is soft, sleek, and smooth. Imagine the feeling of petting a dog or a cat. That is how the texture of real fur would feel. In contrast, faux fur is rough, coarse, and tends to be sticky during hot weather. Imagine the feeling of stroking a stuff toy animal. When the weather is hot and your hands are sweaty, the fiber would feel sticky to touch. One way to see whether your fur is real of fake is the burn test. Pull a few strands out, put them on a ceramic plate, and light them with a match. If the fur is real, it will singe and smell like burnt hair; but if its fake, it will curl into balls and smell like melting plastic. Another way to distinguish between real fur and fake fur is the pin test. Stick a pin into the fur and see if goes through easily. If it does, it means the material is synthetic and the fur is fake; if it doesn’t, then the fur could be real. These are just some of the ways in which you can tell the difference between faux fur and real fur. Aside from these, take note of the label and cost of the fur. This way, you can figure out whether that wrap you are buying is made of fake fur or the real thing. Pretty faux fur wrap fully lined with satin chartreuse to give you a touch of luxury while keeping you warm during your winter wedding. 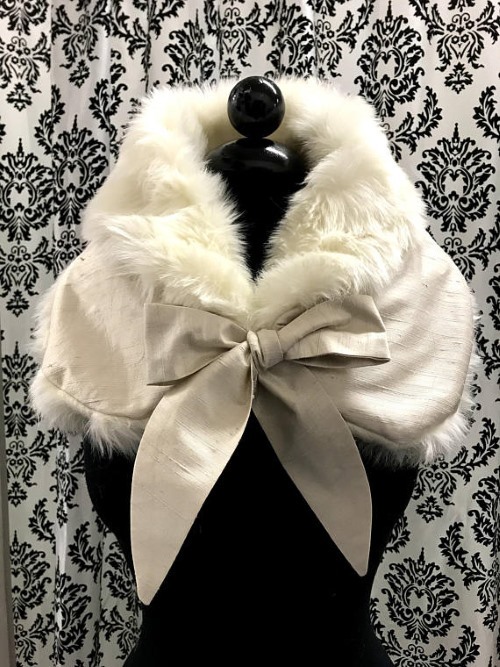 You can wear this stunning high quality faux fur bridal wrap one of two ways: (a) wrapped around your shoulder, or (b) worn on the arms. Hello classic silver screen glamour! 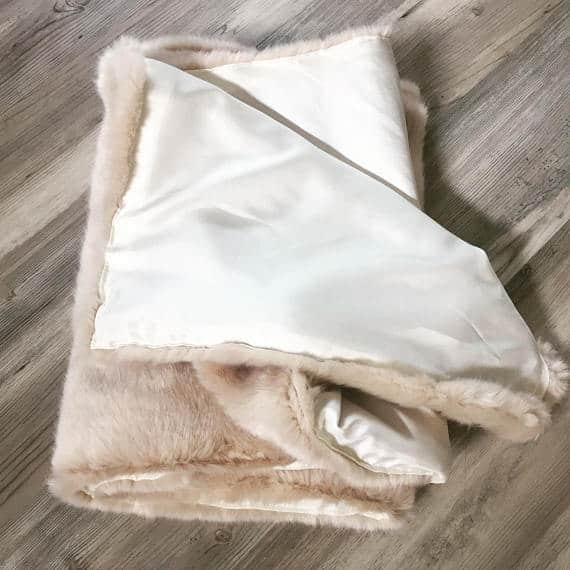 Lovely white mink faux fur is so incredibly soft, will add a final touch to your look on your wedding day. Lush Snow Leopard faux fur shawl makes for the perfect cold weather accessory for a fall or winter wedding. It also has a hidden snap closure so that you don’t have to hold on to it at all times. 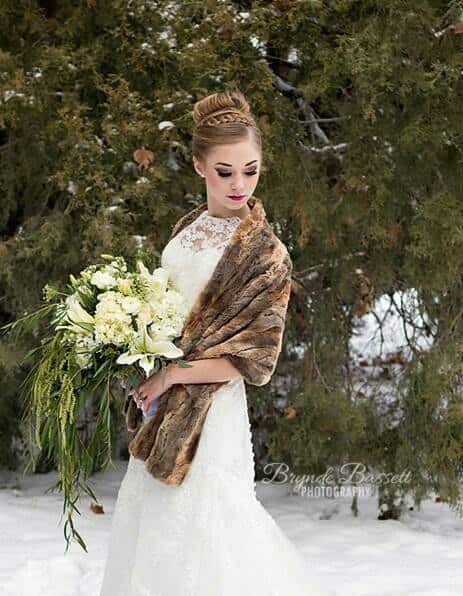 Perfect for a vintage style bride, this luxe faux fur fits perfectly with your bridal attire. Falling just off the shoulder, the plush faux fur creates a luxurious look that will keep you stylishly warm as the temperatures fall. A graceful faux fur wrap fastened with a wide silk bow will complete your winter wedding attire perfectly. 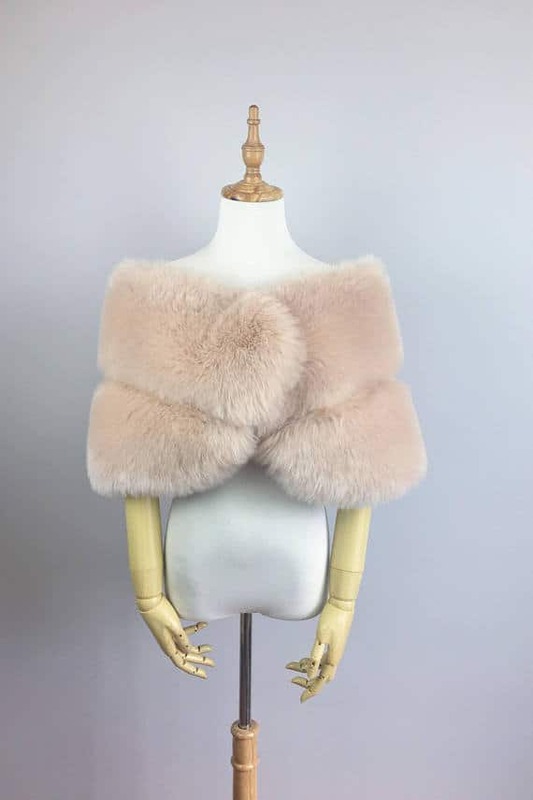 Stepping away from the winter whites and blush pinks, we found this beautiful textured faux fox fur wrap. With various brown tones including, chocolate, caramel, carmel and touches of black, this lovely wrap will be versatile for your big day and many occasions long after the wedding as well. Gift your bridesmaids a special faux fur wrap as a thank you that they can wear to keep warm on the big day. In case you haven’t heard yet, faux fur is in while real fur is out! Many of today’s fashion designers now include faux fur in their line-up. These include not only animal prints, but bright colors and unique patterns as well. If you want your winter wedding to be the talk of the town, then go for faux fur wraps. Your bridesmaids will love them. Faux fur is easier to clean than real fur because it is made of synthetic fibers. Even if you spill some coffee or wine on it, you can remove the stain through spot cleaning. How is that for an easy fix! Some faux fur products will need dry-cleaning, but there are some materials that can be washed by hand. If you set your washing machine to the gentle cycle, this will work for some faux fur products as well. In any case, it is best to hang the faux fur out to dry because the heat from a dryer can destroy the synthetic fibers. Real fur tends to fade and change its color after just one year of use. On the other hand, faux fur will still look great after many years of use. Even if you wear your faux fur frequently, it will still look as good as new each time. You may need to hire a professional cleaner if you have real fur. 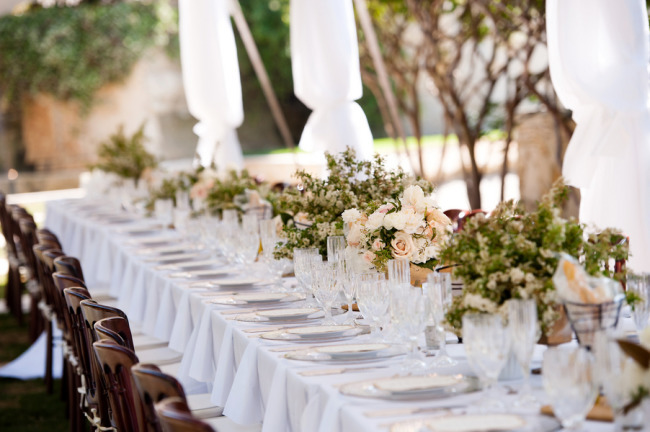 During the summer, you cannot just store it anywhere because the heat and humidity could affect the material. You will need to take on a professional service that can store your real fur in the summer. With faux fur, storage is not a problem. Just put it in a cool, dry place and it will look good in any season. In fact, you can store it together with your other sweaters and coats! Ever since it first came out, the technology used in faux fur production has made significant improvements. Nowadays, you can choose from a variety of faux fur colors, patterns, and designs. Choosing faux fur wraps for you and your bridesmaids is easier and more convenient than ever. What do you think, do you like the faux fur look and style for a winter wedding?